The Agitprop that Dares Speaketh. Charlie Chaplin’s first talkie. For years, he resisted synchronized sound in his films, thinking it would destroy his career. Maybe he was right, considering he only made a few more movies after THE GREAT DICTATOR; maybe it was self-fulfilling prophecy, or maybe it was a combination of changing times and aging man. No matter, as nothing he did could ever destroy his legacy. Story follows a Jewish Barber (Chaplin) blundering through his battles as a soldier for the fictional country of Tomainia during WWI. He unsuccessfully tries to save Officer Schultz (Reginald Gardiner) from a plane crash. Both survive the crash but the Barber loses his memory. Years later, he returns home, unaware of the suffocating new social climate where stormtroopers persecute Jews in the name of the dictator of Tomainia, Adenoid Hynckel (also played by Chaplin). Schultz discovers the Barber in the Jewish ghetto and in gratitude for his help in the plane, saves the Barber from the stormtroopers. The Barber happens to look exactly like the dictator Hynckel, so Schultz (who has been hatching a scheme to overthrow Hynckel) plots to use the Barber as Hynckel’s stand-in to infiltrate the dictatorship. Nothing goes as planned, until the Barber somehow ends up on a stage at a giant rally, dressed as Hynckel, with the opportunity to broadcast to the world. In the film’s climactic scene, the Barber gives a rousing speech that decries dictatorships and calls for humanity to embrace science and progress. Which is either the film’s grandest moment or its sourest note. 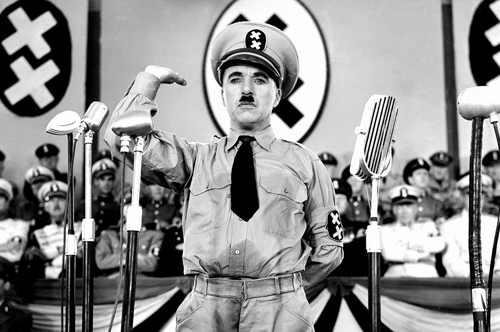 Because the speech is not delivered by dictator Hynckel or plebian Barber, but by politico Chaplin, as he breaks the fourth wall and talks directly to the camera, to we the audience. Some see it as a political punch to the sternum, while others see it as a shark jump destabilizing the film’s tone. As epochs pass and trends shift, it will morph back and forth for better or worse. The first thing we notice about the THE GREAT DICTATOR is that it’s not all that funny. I said it. Because we can hear Charlie talking. And we’re not used to that. And neither is Charlie. It’s a long road to Groucho Marx. Audiences of his day might have roared with laughter at Chaplin’s primordial verbal humor (and a few zingers admittedly sneak through), but Chaplin, having cut his teeth on silent cinema, is the king of physical comedy, with his pioneering inventiveness and shark-tooth execution. This movie slams home how uncomfortable he is with verbal comedy, as he lacks the knack for framing and delivering verbal jokes. The best “verbal” jokes are Hynckel’s gibberish German, sometimes cheekily translated by a narrator, oft-times containing way too many “sauerkrauts” and “da chudens” for comfort. But no matter the amount of throwaway dialogue, the funniest parts in the film are when Chaplin is not talking; like the coin-in-the-pudding to choose a “volunteer,” or the dark metaphor in the visual of Hitler Dancing With Globe (to Wagner’s Lohengrin, Prelude to Act I). Silence will always be Chaplin’s forte. Or maybe he succeeded. For THE GREAT DICTATOR was a smash. How did the Führer react to this uppercut of British propaganda? He was too busy laughing at Groucho Marx in THE BIG STORE. Music: Charles Chaplin, Meredith Wilson. Starring: Charles Chaplin, Jack Oakie, Reginald Gardiner, Henry Daniell, Billy Gilbert, Grace Hayle, Carter DeHaven, Paulette Goddard.